For all the imagined conspiracy floating around within Kyouma Hououin's head, it appears as if our slightly unhinged protagonist has finally stumbled upon the real thing, courtesy of "assistant" Daru's surprising simple job of hacking into CERN's network. Say, you haven't been messing with the PlayStation Network this past week have you, Daru? Anyhow, with some disturbing references to a dead human amidst talk of time travel experimentation found within CERN's records, any further investigation is hindered by the main database which seems to be linked to these experiments proving to be indecipherable by normal, modern means. Indeed, one would need a very specific type of computer to get to grips with the programming language used... an IBM 5100, no less. Thus, Kyouma's hunt for the 5100 begins as he attempts to get in touch with John Titor and other contacts while also bumping into Kurisu Makise, who continues to be oddly fascinated by what she's seen and experienced despite being in denial about the whole microwave incident being in any way related to time travel. Kyouma's hunt for the key to the current mystery before him really only serves to underpin the weird juxtapositions in his life - on the one-hand he's tackling what appears to be a genuine conspiracy, but on the other he's doing so while also fighting with problems like laundry and an equally deluded girl in a maid cafe (aka Feyris) who might just hold the key to his hardware requirements. This mixture of elements does make for a slow release of the vital conspiracy elements of this series, but add just the right dose of frivolity and absurdity to stop the show from becoming bogged down in its own high concept self-importance. 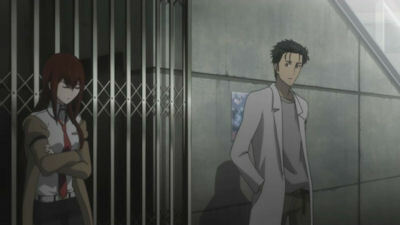 Of course, Steins;Gate is probably going to have to take a dramatic leap figuratively at some point in time to fuel its story, but at the moment it has plenty of time to worth with (ironically) and seems quite comfortable with taking things slowly and making the most of its key elements while also tantalisingly throwing out important titbits such as Makise's insistence that time travel is impossible and the creeping feeling she might know more than she's letting on. For what it's worth, I'm more than happy to see the series continue to go down this path, and it's certainly continuing to entertain me at this point in time.